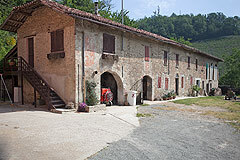 Piemontese farmhouse and Moscato vineyards for sale in Piemonte Canelli Near Canelli, Nizza Monferrato, Asti & Alba (ref: 6837)- Charming country estate comprising of a character stone house for restoration and an immediately habitable home set within 6 hectares of land enjoying commanding vineyard and countryside views.. Piedmont Properties in Piemonte. Property for sale Langhe and Piemonte. Map for Property ref: 6837, Piemontese farmhouse and Moscato vineyards for sale in Piemonte - Charming country estate comprising of a character stone house for restoration and an immediately habitable home set within 6 hectares of land enjoying commanding vineyard and countryside views.